Figure 3: The direction of qibla and Jerusalem from Kūfa. The blue arrow shows the direction of the early mosque. This agrees with Baladhuri's testimony (called the Futuh) that the qibla of the first mosque in Kufa, Iraq, supposedly constructed in 670 A.D. (Creswell 1989:41), also lay to the west, when it should have pointed almost directly south (al-Baladhuri's Futuh, ed. by de Goeje 1866:276; Crone 1980:12; Crone-Cook 1977:23,173). The orientation of the mosques in Wāsiṭ and Baghdād does not agree with Baladhuri’s “testimony” as one can see from the figure; it only implies that the qibla deviated towards west slightly; to be precise 145° 42’ west of North. In fact, the orientation of the earliest mosques of Wāsiṭ, Baghdād and Kūfa are closer to Makkah, negating Smith’s claim that they pointed “closer to the vicinity of Jerusalem”. The original ground-plan of the mosque of Amr b. al As, located in Fustat, the garrison town outside Cairo, Egypt shows that the qibla again pointed too far north and had to be corrected later under the governorship of Qurra b. Sharik (Creswell 1969:37,150). Interestingly this agrees with the later Islamic tradition compiled by Ahmad b. al-Maqrizi that Amr prayed facing slightly south of east, and not towards the south (al-Maqrizi 1326:6; Crone-Cook 1977:24,173). This is an interesting case. 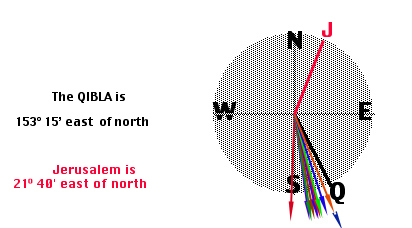 The figure below shows the direction of qibla and Jerusalem from Cairo (very close to Fusṭāṭ). Figure 4: The direction of qibla and Jerusalem from Cairo. The blue arrow shows the direction of the early mosque. The mosque of ʿAmr ibn al-ʿĀṣ in Fusṭāṭ just outside Cairo is at 27° south of East (or 117° east of North) as shown by the blue arrow. This mosque as quoted by Smith as facing slightly south of east is in fact facing towards Makkah, and not Jerusalem and is almost 57° off from Jerusalem! If you take a map you will find where it is that these mosques were pointing. All four of the above instances position the qibla not towards Mecca, but much further north, in fact closer to the vicinity of Jerusalem. Perhaps Smith himself would consider taking a map and discovering where these mosques actually were pointing. None of the four mosques as mentioned he mentioned point to a "closer" vicinity of Jerusalem, let alone to a mysterious sanctuary in northern Arabia. The first mosque to be built in Egypt was built facing winter sunrise, and it was this direction which remained the most popular throughout the medieval period amongst the religious authorities. Likewise some of the earliest mosques in Iraq were built facing winter sunset. Only recently has it become known that astronomical alignments were used for the qibla, so that some modern historians (sic!) have mistakenly inferred from the orientations of the early mosques in Egypt and Iraq that they were not built to face the Kaaba at all, but rather to face some other sacred site. Now, however, we even know why such astronomical alignments were used. This completely refutes the position of Patricia Crone, Michael Cook and Christian missionary Joseph Smith. Let us now tabulate the above information on the orientation of early mosques and winter sunsets and sunrises (i.e., on winter solstice, 21st December) to enhance our understanding. The azimuths were calculated using the programme in the appendix. 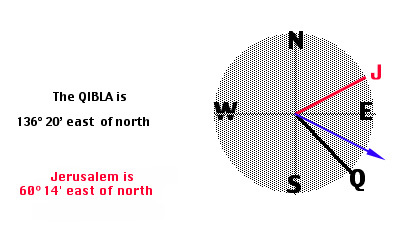 The origin of the qibla, azimuth and mosque orientation is given as east of North. Table I: Orientation of mosques towards winter sunrises or sunsets. The difference of mosque orientation and corresponding winter sunrise/sunsets azimuths for the cities is small except for Kūfa where the orientation of the mosque is closer to actual qibla. This shows that the early mosques (except for Kūfa, of course) were astronomically oriented towards their corresponding winter sunrises/sunsets. What if these mosques were oriented towards summer sunrises and sunsets? Table II: Orientation of mosques towards summer sunrises or sunsets. 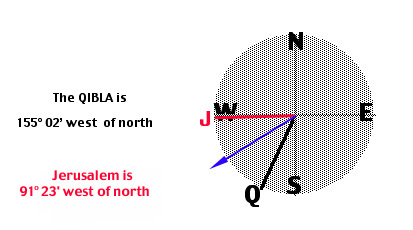 It is interesting to note that if the qiblas of the above mentioned mosques were oriented towards their summer sunsets and sunrises then all the mosques in Iraq would be off from actual qibla direction by >90° (compare Table I and II); Jerusalem will be off by about 30°. Only the mosque in Egypt would be oriented in the direction of Jerusalem (Table II). From a quick glance at Figures 1-3, it can be seen that the qibla of the mosques in Iraq would be oriented towards Jerusalem had the Muslims chose the sunset during the equinoxes to align the direction. This is left as an exercise for the readers to verify themselves using the formula in appendix. In summary, the aligning the mosques in Iraq by using winter sunset would be the best way to get nearer to qibla. Similarly aligning the mosque in Egypt towards winter sunrise gives rise to a qibla very close to the computed one. But still a lingering question exists. Why did the Muslims chose the winter sunset for the mosques in Iraq and winter sunrise for the mosque in Egypt for their respective qiblas? What was the relationship of this astronomical phenomena with respect to Kʿabah? The answers to this is in the astronomical orientation of Kʿabah. It has recently become evident that astronomical alignments were widely used by Muslims over the centuries for finding the qibla and for orienting mosques towards the Kʿabah. The qibla of some of the early and medieval mosques were intended to be “parallel” to one of the walls of Kʿabah, this “parallelism” being achieved by facing the mosque towards the same astronomical horizon phenomena as one would be facing when standing in front of appropriate wall of the Kʿabah. 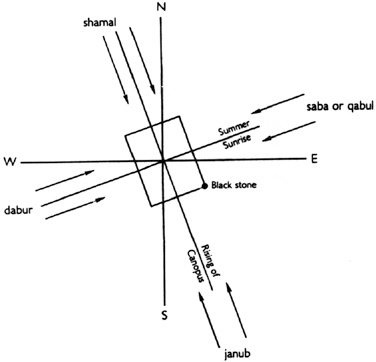 The reason for the use of astronomical alignments, particularly cardinal and solstitial directions and the rising point of the star Canopus, can now be understood in the light of the astronomical alignment of Kʿabah itself. The use of astronomical alignments (and also directions associated with the winds, see Figure 11) for qibla was actually favoured by the religious authorities over the qibla directions computed mathematically by the Muslim astronomers in medieval times. Figures 5 and 6 show the astronomical alignment of the Kʿabah as implied by the MS Milan Biblioteca Ambrosiana 73 Sup., a treatise authored by a Yemeni astronomer Muhammad ibn Abi Bakr al-Farisi (c. 1290). Figure 5: The alignments of the Kaabah implied by the first section of the text illustrated in MS Milan Biblioteca Ambrosiana 73 Sup. Figure 6: The alignments of the Kaabah implied by the second section of the text illustrated in MS Milan Biblioteca Ambrosiana 73 Sup. Figure 7: Actual alignments of the Kaabah. Figure 8: Astronomical alignments of the Kaabah drawn to scale. ... one must add the reports noted by some scholars concerning ʿAmr bin al-ʿAs's prayer in a church in Egypt, where he made only a slight diversion from its eastern qibla, as well as the fact that the mosque which bears his name had one "very much turned towards the east" (qibla musharriqa jidan) and that it remained so until turned south towards Mecca by al-Walid's governor, Qurra b. Sharik, in 92 AH. The qibla of Cairo is 46° 20’ south of east not “south towards Mecca”. The amount of deviation is not indicated in the sources quoted by Crone and Cook, Bashear and Sharon but all of them suggested that ʿAmr ibn al-ʿĀṣ prayed facing slighly south of East or slightly turned away from East. This would mean that he faced roughly the winter sunrise that is only a slight diversion from East; 27° south of East to be precise. In the light of above source quoted by Bashear we wonder what was there for Qurra bin Sharik to correct the qibla! We do not have know of any literary sources that say Qurra bin Sharik re-oriented the mosque accurately towards the qibla. This is because the mosque of ʿAmr ibn al-ʿĀṣ even today is oriented towards the winter sunrise. Sharon, in fact, acknowledges the fact that the mosque of ʿAmr ibn al-ʿĀṣ is oriented towards winter sunrise but this contradicts his own thesis that the qibla of mosques of early Muslims in Christian-dominated areas such as in Syria and Egypt was the qibla of Christians, due East! It makes us wonder how good is Sharon’s sense of direction when he mentions that the qibla in Syria is due east. He does not mention any sources to support his claim. What is clear is that he does not understand the finer points of astronomy; the difference between winter sunrise and equinoctial sunrise. Perhaps he is also unaware of some of the recent literary sources that mention the use of astronomical alignments to direct the early as well as medieval mosques towards their qiblas. 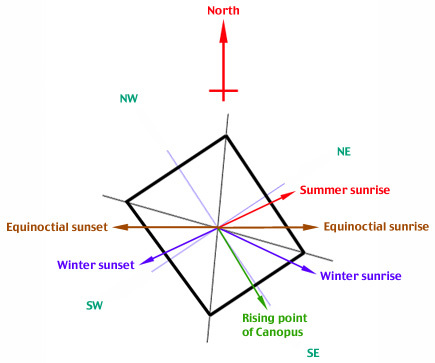 Our sources state that, for example, the qibla in North West Africa is towards the rising of the sun at the equinoxes, due east; that the qibla in Egypt is towards the rising of the sun at midwinter; that the qibla in Yemen is towards the direction from which the north wind blows or is towards the Pole Star, which does not rise or set, but whose position defines north; that the qibla in Syria is towards the rising of the Canopus; that the qibla in Iraq is towards the setting of the sun at midwinter; and that the qibla in India is towards the setting of the sun at the equinoxes, due west. It can be deduced that the mosques oriented using astronomical phenomena were not often oriented accurately towards qibla. This, in actuality, proves the opposite of Crone and Cook as well as Smith’s claim. The structure of the sentence clearly shows that there were two different places: Jerusalem and the Kʿabah (notice also the plural form of “place” and “race”). Any attempt to claim that there was more than one Kʿabah is merely clutching at straws. The word Kʿabah in Arabic means “cube” and the only Kʿabah is that found in Makkah. 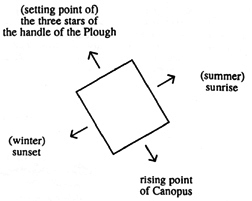 In Egypt, the Muslims prayed towards “east” (i.e., the winter sunrise) as being almost correctly observed by Jacob of Edessa (see Figure 4). What is more interesting is that Jacob of Edessa asserts the qibla of Muslims by saying they always prayed towards Kʿabah no matter where they were. Crone and Cook as well as Smith base their hypothesis on what one may call outright quackery. 5. Early Mosques In Negev: How Were They Oriented? Since Crone and Cook deduced from the qibla of the early mosques that there were aligned somewhere towards a mysterious sanctuary in northern Arabia, we would like to add remind that they conveniently forgot to mention the orientation of one of the the earliest mosque: al-Masjid al-Aqṣa. This mosque is oriented due south, towards Makkah. Further, we would also like to add a recent study to check the claims of Crone and Cook. Figure 9: The direction of qibla from Sede Boqer. The coloured arrows show the direction of the qiblas of 12 mosques studied by Avni. The mosque in Sede Boqer itself is oriented at 166° east of north, off by about 13° from the true qibla. The rising of Canopus is shown by a blue arrow-head in the bottom of the figure. As one can see that maximum deviation from the actual qibla is about 29° for a mosque which has its qibla pointing due south. Rest are deviated between 5 to 19° from the actual qibla. The question now is: what was the method used to align these open mosques in the Negev highlands to such a high degree of accuracy? Certainly it was not the sunrise during summer, winter or equinox. Could it be the rising of one of the stars, e.g., Canopus, one of the brightest in the southern hemisphere? To confirm our doubts we ran the simulation of the night sky at Sede Boqer using Starry Night Backyard 3.1 software. The results were quite stunning. Figure 10: A simulation of Canopus rising at Sede Boqer at an azimuth of 158°. 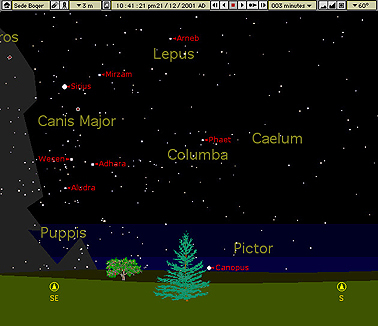 Canopus rises at Sede Boqer at an azimuth of 158° (east of north). The qibla at Sede Boqer is 153° 15’ east of North. The difference is mere 5°! The 11 mosques are oriented between 158 to 172° and only one a bit off to about 182° (Figure 9). Aligning the mosques using Canopus would mean “facing” the northwest (or southeast) wall of Kʿabah (Figure 8). Although we do not know of any Islamic literary sources to substantiate our claim, we are pretty certain that Canopus was used to align these open mosques towards the qibla. It is worth adding that none of these early mosques are oriented towards northern Arabia or Jerusalem. Now that we have sorted out the main issues, let us now turn our attention to finding out qibla according to Islamic tradition. This would help us understand some of the issues surrounding the qibla being off by certain degrees. After this we will discuss various methods of qibla determination used by early Muslims before the advent of mathematical calculation-based qiblas. There are several traditions in the Islamic heritage showing that the determination of the qibla was accomodated with some flexibility except for Makkah owing to the little knowledge in the fields of geography and geometry in the early centuries of Islam. Such traditions can be found in several ḥadīth collections like Sunan al-Tirmidhi, Sunan Ibn Majah and Muwaṭṭaʾ Mālik as stated below. Malik narrated to me on the authority of Nafiʿ that ʿUmar ibn al-Khaṭṭāb said: "[Anywhere] between the East and the West is taken as a qibla as long as one heads towards the House". Concerning "[Anywhere] between the East and the West is a qibla", Aḥmad ibn Ḥanbal said: "This applies to all countries except in Makkah at the House [i.e., the Sacred Mosque] where whoever shifts from it has missed the qibla." Ahmad ibn Khalid said: "This hadith applies to the inhabitants of Madinah and whoever is like them whose qibla is between East and West", narrated by Muhammad ibn Maslamah from Malik. Ahmad ibn Khalid said: "As for those who are located to the East of Makkah or to the West, their qibla is between South and North and they have room in that [i.e., flexibility in the determination of the direction] as much as the inhabitants of Madinah and others have." This opinion mentioned by Ahmad ibn Khalid is clear and correct but it goes in pairs with the effort [ijtihad] for whoever is knowledgeable in this respect. This is due to the fact that in their facing the qibla the people are in two categories. First, those who can see the House must head towards it and it is not permissible for them to do otherwise because it is mandatory for those who see the qibla to follow it and whoever does not has shifted from it undoubtedly, which is not permissible and there is no disagreement about that. A similar opinion has been narrated from Muhammad ibn Maslamah. Secondly, those who cannot see the qibla are either people able of performing ijtihad or imitators. Those who are able of performing ijtihad are bound to do it in order to determine the direction of the qibla between East and West while heading towards the House. But, those who are not fit for ijtihad are bound to follow the latter if any. Otherwise, said Qadi Abu al-Walid, may Allah be pleased with him, he has the status of someone from whom the evidence pointing to the qibla is concealed. I'd rather prefer that he delays his prayers to the end of their alloted times hoping that he might find someone to imitate and this applies to every place except al-Madinah where it is not suitable to make an ijtihad leading to a qibla different than the qibla of the Mosque of the Prophet, peace be upon him, since it is the Prophet, peace be upon him, is the one who set its qibla and this constitutes an evidence from him in this regard. Ibn al-Qasim narrated from Malik that Jibril, peace be upon him, is the one who determined for the Prophet, peace be upon him, the qibla of his mosque. Muhammad ibn Abi Maʿshar told us, my father told us on the authority of Muhammad ibn ʿAmr from Abu Salamah from Abu Hurayrah that the Messenger of Allah, peace be upon him, said "[Anywhere] between the East and the West is a qibla." Yahya ibn Musa narrted to us on the authority of Muhammad ibn Abi Maʿshar likewise. Abu ʿIsa said: "The hadith of Abu Hurayrah has been narrated through other ways. Some scholars have spoken about Abu Maʿshar with regards of his [bad] memory, his name is Nujayh the freed slave of Banu Hashim." Muhammad [al-Bukhari] said: "I don't narrate anything from him while the people have narrated from him". Muhammad said: "The hadith of ʿAbdullah ibn Jaʿfar al-Makhrami from ʿUthman ibn Muhammad al-Akhnasi from Saʿid al-Maqbari from Abu Hurayrah is sounder and more authentic than the hadith of Abu Maʿshar". With regards to the Messenger of Allah, peace be upon him, said "[Anywhere] between East and West is a qibla." Al-Suyuti said: "This is not a general statement about every country, it only applies to al-Madinah and its likes." Al-Bayhaqi said in Al-Khilafiyyat [The Controversial Matters]: "Those who are meant [by this hadith], and Allah knows best, are the inhabitants of al-Madinah and whoever his qibla is the same as the people of al-Madinah." Al-Shawkani said: "There has been a disagreement about the meaning of this hadith." Al-ʿIraqi said: "This is not a general statement about all countries, it is rather a applicable to Al-Madinah and any spot having the same qibla and this was the opinion of al-Bayhaqi in Al-Khilafiyyat and that of Ahmad ibn Khaluweih al-Rahbi who said: the other countries have a similar room in determining the qibla between South and North." Likewise, ibn ʿAbd al-Barr said: "This is correct and cannot be refuted and there is no disagreement between the scholars about it." Al-Athram said: "I asked Aḥmad ibn Ḥanbal about the meaning of this hadith, he said: "This is applicable to all countries except Makkah at the House, shifting from it slightly is no less than missing the qibla." Then he said: "This is the East" and he pointed towards it, and "this is the West" and pointed towards it and between them is a qibla. I told him: "Whoever heads between them in his prayer, his prayer is valid. He said: "Yes, and he must seek the middle." ibn ʿAbd al-Barr commented on Ahmad's statement "This is applicable to all countries" saying that he means all the countries who like al-Madinah head towards the South where the Kʿabah is located and so they head towards it and can go aside to the right and to the left between the East and the West putting the West on their righthand side and the East on their lefthand side. Similarly, the people of Yemen have the same flexibility in their qibla between the East and the West, when they head towards the qibla they out the East on their righthand side and the West on their lefthand side. Similarly, the people of Iraq and Khurasan have the same room in facing the qibla between the South and the North. The people at the opposite to Iraq face at the opposite of this. The qibla is restricted only for the people in the Holy Mosque. It widens a little for the inhabitants of Makkah, and widens a little more for the people of the Haram [the precincts of the Holy Land] and then it is as wide as described earlier for the people of other locations". Al-Hasan ibn Bakr al-Marwazi told us, al-Muʿalla ibn Mansur narrated to us on the authority of ʿAbdullah ibn Jaʿfar al-Makhrami from ʿUthman ibn Muhammad al-Akhnasi from Saʿid al-Maqbari from Abu Hurayrah that the Prophet, peace be upon him, said: "Between the East and the West is a qibla." Abu ʿIsa said: "This hadith is hasan sahih. The narrator was called ʿAbdullah ibn Jaʿfar al-Makhrami because he is the son of al-Miswar ibn Makhramah. Several people among the Companions of the Prophet, peace be upon him, narrated that between the East and the West is a qibla among them are ʿUmar ibn al-Khaṭṭāb, ʿAli ibn Abi Talib, ibn ʿAbbas and ibn ʿUmar said: "If you let the West on your right hand side and the East on the lefthand side, wherever in between is a qibla if you are seeking to head towards the qibla. ibn al-Mubarak said: "Anywhere between the East and the West is a qibla this is for the people of the East." And he chose for the people of Marw [a location in Persia] to head to the left. Let us now summarize the discussion. All the material above shows that the early salaf accepted some flexibility in the determination of the qibla and that it was not determined with a compass precision as the early Muslims did not have the tools to find that precision. The use of prophetic saying to know the qibla is used even today. In the Hanafi, Maliki and Hanbali schools of Islamic Jurisprudence, the criterion of facing the direction of prayer (i.e., qibla) is merely that some portion of the person’s face to be directed towards the Kʿabah. This takes in 180°, from far left to far right, such that when the Kʿabah is anywhere between, one is considered facing the prayer. In the Shafi‘i school, facing the direction of prayer is a necessary condition. If the direction is not known that the person asks someone who knows; if no such person is available he uses personal reasoning. It is, however, somewhat unlikely that recent conquerors [i.e., the Muslims] with a strong sense of where they came from should have adopted a simplistic qibla notion popular with ‘ulama in medieval Central Asia and Spain. The sense of direction of humans is not as strong as migratory birds. It might be argued that, if people have travelled, most people have at least a vague notion of the direction from which they have travelled, even over long distances. Of course, this is especially true during the advent of Islam when the tools for accurately determining the direction were not available at all. Crone constructs her line of reasoning upon rather flimsy grounds. Throwing around words like “strong sense”, “aiming at precision”, etc., shows the desperation to arrive at a pre-conceived conclusion rather than dealing with the topic in an objective, methodical fashion. We have already seen one such example. In the first two centuries of Islam, when mosques were being built from Andalusia to Central Asia, the Muslims had no truly scientific means of finding the qibla. Clearly they knew roughly the direction they had taken to reach wherever they were, and the direction of the road in which pilgrims left for Mecca could be, and in some cases actually was, used as a qibla. But they also followed two basic procedures, observing tradition and developing a simple expedient. the qibla is between the east and the west. The practice of the Prophet was imitated by the believers. When he was in Madinah, he prayed southwards towards Makkah; and there were those who were contend to follow his example and pray towards the south wherever they were, be it in Andalusia or Central Asia, an important point to which we will come later. Others followed the practice of the first generation of Muslims who laid out the first mosques in different parts of the Islamic World that were based on the Prophetic tradition and astronomical horizon phenomena. The mosques that were converted from earlier religious edifices, the orientation of which was considered acceptable for the qibla; such was the case, for example, in Jerusalem and Damascus, where the qibla adopted was due south. How were the early churches converted to mosques? At Homs, for example, they took a fourth part of the church of St. John. How was a church converted into a mosque? One can easily guess. In Syria the qibla is due South, where as churches are turned towards the east. Under these circumstances it was only necessary to close the western entrance, pierce a new entrance in the north wall and pray across the aisles. This is exactly what happened as can be verified in the Great Mosque of Hama where the west front of the Kanisah al-‘Uzma (Great Church) which was converted into a mosque in A.D. 636-7, now forms the west end in the sanctuary. Its three western doors have been converted into windows and is now entered from the north. Creswell also mentions about the mosques in Persia particularly at Istakhr and Qasvin which were perhaps converted from apadana, or hypostyle hall of Persian kings, with a flat roof resting on columns with double-headed capitals. Many early mosques were laid in the direction defined by astronomical horizon phenomena, such as the rising and settings of the sun at the equinoxes or solstices and of various prominent stars and star groups; such was the case, for example, in Egypt and Central Asia, where the earliest mosques were aligned towards winter sunrise and winter sunset, respectively. The directions known as Qibalat al-Ṣaḥabah, the “Qibla of the Companions”, remained popular over the centuries. One such example is the mosque of ʿAmr ibn al-ʿĀṣ in Fusṭāṭ just outside Cairo, that we had discussed earlier, faces the winter sunrise. Astronomical alignments were used for the qibla because the fiirst generation of Muslims who were familiar with Kʿabah knew that when they stood in front of the edifice, they were facing a particular astronomical direction. In order to face the appropriate part of the Kʿabah which was associated with their ultimate geographical location, they used the same astronomically-defined direction for the qibla as they would have been standing directly in front of that particular segment of Kʿabah. This notion of qibla is, of course, quite different from that used by astronomers. Such simple methods for finding the qibla by astronomical horizon phenomena are outlined in the legal texts and in treatises dealing with folk astronomy. In medieval sources, we also find qibla directions expressed in terms of wind directions. 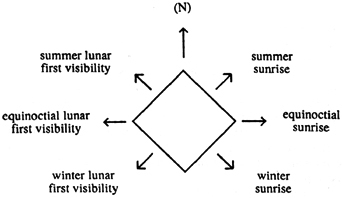 Several wind schemes defined in terms of solar or steller risings and settings, were part of the folk astronomy and meteorology of pre-Islamic Arabia [as shown in the Figure below]. The folk astronomy flourished along with the mathematical astronomy (from 3rd / 9th century onwards), but was far more widely known and practiced. The determination of qibla in the mosques converted from earlier religious edifices or the early mosques, as one can easily see, was only a rough guess and involved following the practice of the Prophet, his Companions or the first generation of Muslims. Figure 12: A simple scheme of sacred geography in the published text of the Kitab al-Masalik of ibn Khurradadhbih (3rd / 9th century). From 3rd / 9th century onwards, Muslim astronomers working in the tradition of classical astronomy devised methods to compute the qibla for any locality from the available geographical data. For them, the qibla was the direction of greater circle joining the locality to Makkah, measured as an angle to the local meridian. 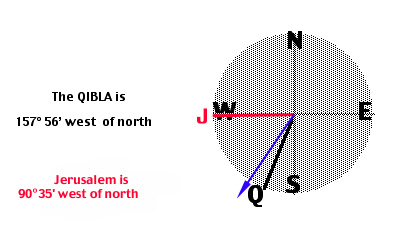 The determination of qibla according to this definition is a non-trivial problem of mathematical geography, whose solution involves the application of complicated trignometric formulae or geometrical considerations. Lists of qibla values for different localities and tables displaying the qibla for each degree of longitude and latitude difference from Makkah were available. However, mathematical methods were not available to the Muslims before the late 2nd / 8th and early 3rd / 9th centuries, the qibla was not generally found by computation anyway even after the mathematical solutions were available. This is very well illustrated in the diagram below for qiblas in the cities of Cordova, Cairo and Samarqand. 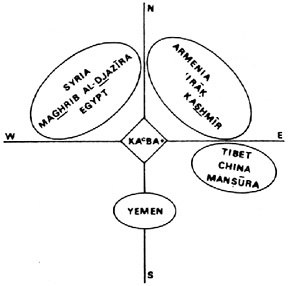 Figure 13: Different qibla directions that were used at different times for (1) Cordova, (2) Cairo, and (3) Samarqand, according to various medieval sources. Below is the description of various qiblas in the above cities. Cordova, Spain: According to a 12th(? )-century treatise on the astrolabe, the following directions were used in Cordova: (a) the direction computed using the standard approximate formula; (b) the direction of winter sunrise; (c) southeast (this depends upon my interpretation of the garbled text); (d) the direction of the Grand Mosque ('perpendicular' to the northwest wall of the Kʿabah); and (e) due south (not specifically mentioned in this text). Cairo, Egypt: According to the 15th-century Egyptian historian al-Maqrizi, the following directions were used in Cairo: (a) due east (not specifically mentioned); (b) the direction of winter sunrise (this is the qibla of the Companions of the Prophet; (c) the direction computed (by the astronomer Ibn Yunus) using an accurate formula; (d) the orientation of the Mosque of Ibn Tulun (variously explained); and (e) any direction between the rising and setting of Canopus. Samarqand, Uzbekistan: According to the 11th-century legal scholar al-Bazdawi, the following directions were used in Samarqand: (a) due west (Hanafi legal school) (corresponds to the direction in which the road to Makkah left Samarqand); (b) the direction of winter sunset (as used for the Grand Mosque); (c) southwest (underlies a table presented by al-Bazdawi and lifted from some earlier source); (d) the direction computed using mathematical formulae (not specifically mentioned); and (e) due south (Shafi‘i legal school) (corresponds to the qibla used by the Prophet in Medina). It was claimed by Crone, Cook and Smith that the early mosques pointed towards an unnamed sanctuary in northern Arabia or even close vicinity of Jerusalem. However, a closer analysis using the modern tools available to us show that the qiblas of early mosques were oriented towards astronomical alignments; winter sunrise of mosque in Egypt and winter sunsets for mosques in Iraq. It was shown conclusively that the early mosques do not point at northern Arabia or even close vicinity of Jerusalem. We also added the study of 12 early mosques in Negev highlands to support our conclusions. In the early centuries of Islam, Muslim did not have tools to determine the qibla with precision. Only from third century onwards mathematical solutions for determining qibla were available; even then their use was not widespread. The folk astronomy retained its strength as suggested by various mosques in Cairo, Cordova and Samarqand. This gave rise to various directions of qibla, sometimes way off from the true direction. Latitude: ° ' " Longitude: ° ' "
Compare the results with the ones obtained from US Naval Observatory. This calculation does not foresee sunrise and sunset in geographical places with permanent day or night, i.e., at the poles. The origin of the azimuth is the cardinal point North. A value of 242° would indicate 242° east of north (or 62° west of south). For locations West of Greenwich (i.e., negative geographical longitude), for example -10°10’10”, put negatives in the boxes all the variables -10°-10'-10".The same holds true for the latitude. Azimuth: The horizontal angular distance from a fixed reference direction to a position, object, or object referent, as to a great circle intersecting a celestial body, usually measured clockwise in degrees along the horizon from a point due north. Vernal Equinox: The Vernal Equinox is one of the two points where the Ecliptic crosses the Celestial Equator. At the Vernal Equinox the sun appears to be moving across the equator from the Southern Celestial Hemisphere to the Northern Celestial Hemisphere. The arrival of the sun at the Vernal Equinox on or about March 21 marks the beginning of Spring. Autumnal Equinox: The Autumnal Equinox is one of the two points where the Ecliptic crosses the Celestial Equator. At the Autumnal Equinox the sun appears to be moving across the equator from the Northern Celestial Hemisphere to the Southern Celestial Hemisphere. The arrival of the sun at the Autumnal Equinox on or about September 23 marks the beginning of Autumn. Summer Solstice: This is the time when the Sun reaches its most northerly point. It marks the beginning of Summer in the Northern Hemisphere, and the opposite in the Southern Hemisphere. This happens on June 21st. Winter Solstice: This is the time when the Sun reaches its most southerly point. It marks the beginning of Winter in the Northern Hemisphere, and the opposite in the Southern Hemisphere. This happens on December 21st. P. Crone & M. Cook, Hagarism: The Making Of The Islamic World, 1977, Cambridge University Press, pp. 23-24. The latitude and longitude of Wāsiṭ and Kūfa were obtained from Heavens-Above. P. Crone, Meccan Trade And The Rise Of Islam, 1987, Basil Blackwell: Oxford, p. 198. See footnote 131. P. Crone & M. Cook, Hagarism: The Making Of The Islamic World, op. cit., pp. 23-24. P. Crone, "The First Century Concept Of Higra", Arabica, 1994, Vol. XLI, pp. 386-387. Abi al-Abbas Ahmad b. Yahya b. Jabir al-Baladhuri (Ed. M. J. De Goeje), Futuh al-Buldan, 1866, E. J. Brill: Leyden, p. 276. Al-Baladhuri did not supply any angle of deviation of the mosque. Not surprisingly, Crone and Cook quoting al-Baladhuri say that “this is implied by the tradition about the first mosque at Kūfa....”, see Hagarism: The Making Of The Islamic World, op. cit., pp. 173, footnote 27. Italics are ours. We calculated the qibla from the plan of the mosque provided in "Architecture", Encyclopaedia Of Islam, 1960, Volume 1, E. J. Brill: Leiden, p. 611. D. A. King, "Science In The Service Of Religion: The Case Of Islam" in Astronomy In The Service Of Islam, 1993, Variorum: Hampshire (Great Britain), p. 260. See Figure 12. D. A. King, "The Sacred Direction In Islam: A Study Of Interaction Of Religion & Science In The Middle Ages", Interdisciplinary Science Reviews, 1985, Volume 10, p. 319. For a general review on this topic see D. A. King's, "Astronomical Alignments In The Medieval Islamic Architecture", Annals Of The New York Academy Of Sciences, 1982, Vol. 385, pp. 303-312. G. S. Hawkins & D. A. King, "On The Orientation Of The Kʿabah", Journal For The History Of Astronomy, 1982, Volume 13, pp. 103-105. Hoyland considers Hawkins' and King's idea to be “insightful and revealing of medieval times” but rejects when the ideas are “retrojected to the first two centuries of Islam.” He thinks that the alignment of the early mosques such as the mosque of ʿAmr ibn al-ʿĀṣ in Fusṭāṭ facing towards winter sunrise as “conjectures”; see R. G. Hoyland, Seeing Islam As Others Saw It: A Survey And Evaluation Of Christian, Jewish And Zoroastrian Writing On Early Islam, 1997, The Darwin Press, Inc.: Princeton (New Jersey), p. 573. It has been clearly shown by us through calculations that the orientation of the early mosques in Egypt and Iraq were indeed oriented towards known astronomical phenomena. Nevertheless, Hoyland offers a good critique of Crone and Cook's hypothesis about qibla of early mosques. G. S. Hawkins & D. A. King, "On The Orientation Of The Kʿabah", Journal For The History Of Astronomy, op. cit., p. 107 for the orientation of Kʿabah. The azimuths of sunrises and sunsets were computed using the formula in appendix. The azimuth for Canopus was found using Starry Night Backyard 3.1 software. S. Bashear, "Qibla Musharriqa And Early Muslim Prayer In Churches", 1991, The Muslim World, Volume LXXXI, Nos. 3-4, p. 268. P. Crone & M. Cook, Hagarism: The Making Of The Islamic World, op. cit., p. 173, see footnote 29. M. Sharon, "The Birth of Islam In The Holy Land", in M. Sharon (Ed.) The Holy Land In History And Thought: Papers Submitted To The International Conference On The Relations Between The Holy Land And The World Outside It, Johannesburg 1986, 1988, E. J. Brill: Leiden, p. 230. D. A. King, "The Sacred Direction In Islam: A Study Of Interaction Of Religion & Science In The Middle Ages", Interdisciplinary Science Reviews, op. cit., p. 320. P. Crone & M. Cook, Hagarism: The Making Of The Islamic World, op. cit., p. 173. See footnote 30. Also see W. Wright, Catalogue Of Syriac Manuscripts In The British Museum Acquired Since The Year 1838, Part II, 1871, British Museum: London, p. 604. G. Avni, "Early Mosques In The Negev Highlands: New Archaeological Evidence On Islamic Penetration Of Southern Palestine", 1994, Bulletin Of The American Schools Of Oriental Research, Volume 294, pp. 83-100. ibid., see p. 95 for all the table of type of the mosque and its orientation in various locations in Negev highlands. Due to the closeness of these settlements the deviation of the qibla from the reference Sede Boqer does not exceed more than ± 3°. Nuh Ha Mim Keller, The Reliance Of The Traveller: A Classic Manual Of Islamic Sacred Law, 1994, Amana Publications: Beltsville (Maryland, USA), pp. 123-125. Parts of discussion in this section are taken from D. A. King, "Science In The Service Of Religion: The Case Of Islam", Astronomy In The Service Of Islam, 1993, op. cit., pp. 245-262. This is a very well-known fact. The early Muslim astronomers used it, the modern qibla calculating programmes as well as watches apply these principles. For details on Islamic astronomy see, D. A. King's "Universal Solutions In Islamic Astronomy", From Ancients Omens To Statistical Mechanics: Essays On The Exact Sciences Presented To Asger Aaboe, J. L. Berggren & B. R. Goldstein (Eds. ), 1987, Copenhagen University Library: Copenhagen, pp. 121-132. Also see D. A. King, "Universal Solutions To Problems Of Spherical Astronomy From Mamluk Egypt & Syria", A Way Prepared: Essays On Islamic Culture In Honor Of Richard Bayly Winder, in F. Kazemi & R. D. McChesney (Eds. ), 1988, New York University Press: New York, pp. 153-184. For early Islamic mathematical methods for qibla computation see D. A. King, "The Earliest Islamic Mathematical Methods & Tables For Finding The Direction Of Mecca", Zeitschrift für Geschichte Der Arabisch-Islamischen Wissenschaften, 1986, Volume 3, Institut für Geschichte Der Arabisch-Islamischen Wissenschaften: Franfurt, pp. 82-149 (with corrections listed in ibid, 4, 1987/88, p. 270). For watches see, e.g., catalogue of Casio qibla calculating watch. David A. King, "Science In The Service Of Religion: The Case Of Islam", Astronomy In The Service Of Islam, 1993, op. cit., p. 253. K. A. C. Creswell, A Short Account Of Early Muslim Architecture, 1968, Librairie Du Liban, Beirut, p. 7. David A. King, "Science In The Service Of Religion: The Case Of Islam", Astronomy In The Service Of Islam, 1993, op. cit., p. 260. D. A. King, "The Sacred Direction In Islam: A Study Of Interaction Of Religion & Science In The Middle Ages", Interdisciplinary Science Reviews, op. cit., p. 327. "Makka" in C. E. Bosworth, E. Van Donzel, B. Lewis & Ch. Pellat (Eds. ), Encyclopaedia Of Islam, Volume VI, E. J. Brill: Leiden, p. 183. D. A. King, "The Sacred Direction In Islam: A Study Of Interaction Of Religion & Science In The Middle Ages", Interdisciplinary Science Reviews, op. cit., p. 325.